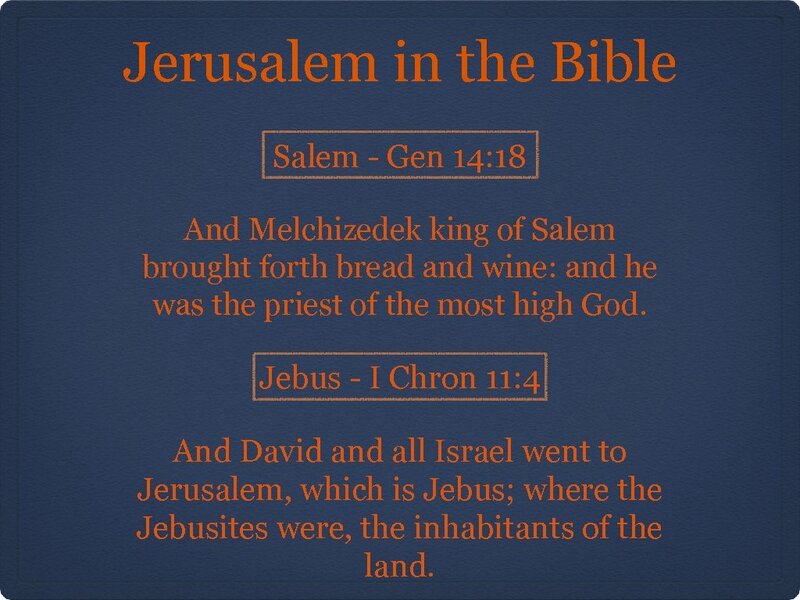 Jerusalem in the Bible Salem - Gen 14: 18 And Melchizedek king of Salem brought forth bread and wine: and he was the priest of the most high God. 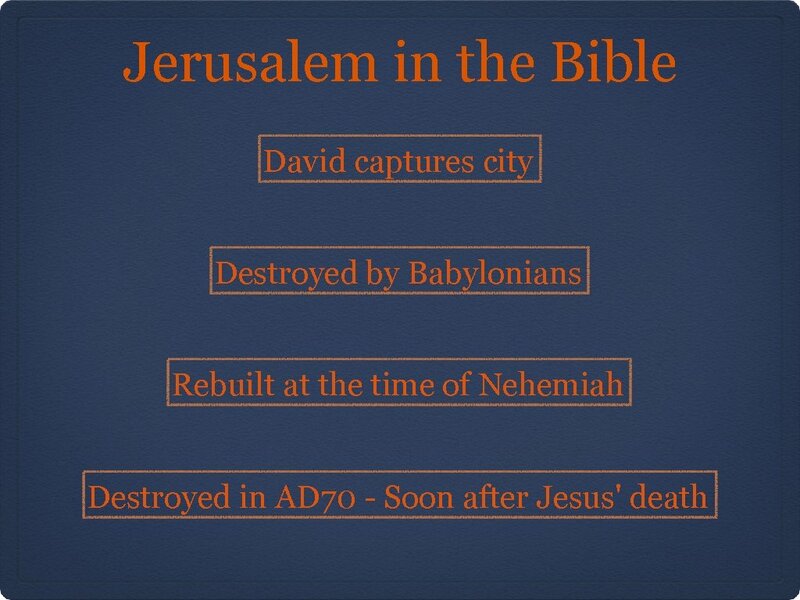 Jebus - I Chron 11: 4 And David and all Israel went to Jerusalem, which is Jebus; where the Jebusites were, the inhabitants of the land. 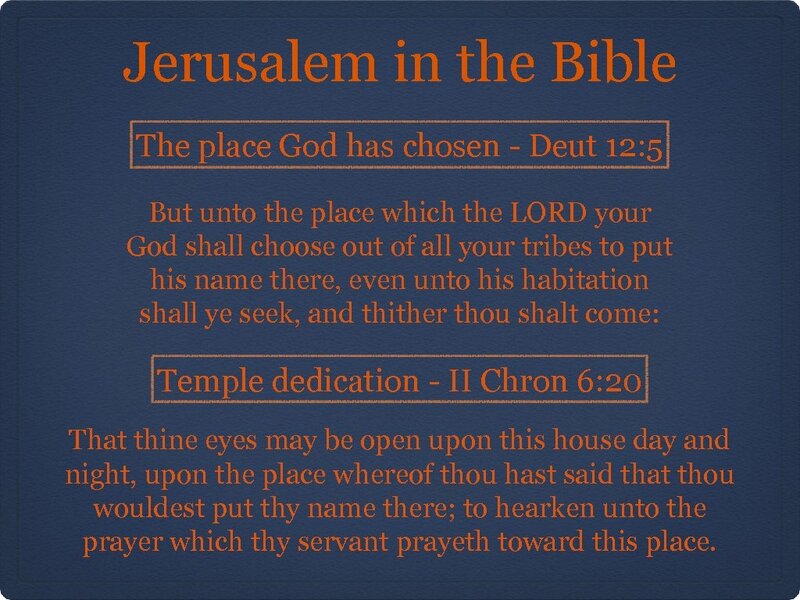 Jerusalem in the Bible The place God has chosen - Deut 12: 5 But unto the place which the LORD your God shall choose out of all your tribes to put his name there, even unto his habitation shall ye seek, and thither thou shalt come: Temple dedication - II Chron 6: 20 That thine eyes may be open upon this house day and night, upon the place whereof thou hast said that thou wouldest put thy name there; to hearken unto the prayer which thy servant prayeth toward this place. 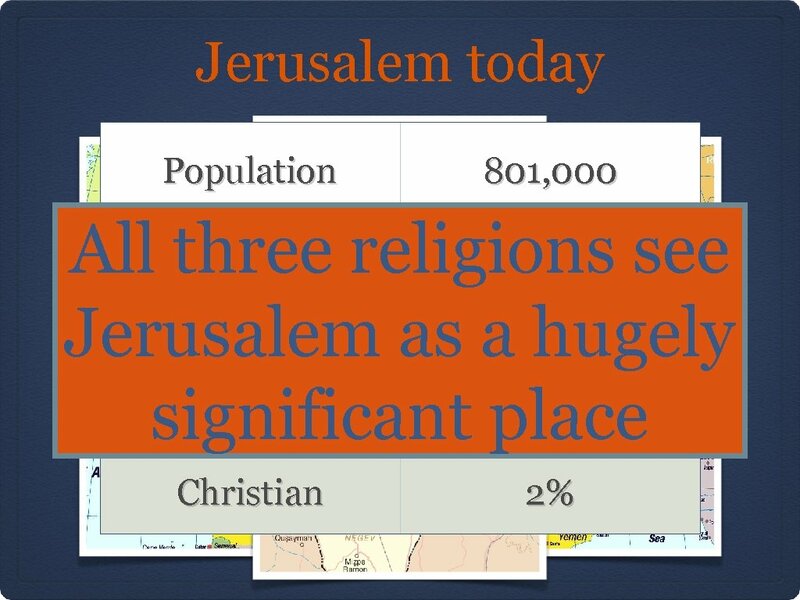 Jerusalem: Political capital Isaiah 2: 3 And many people shall go and say, Come ye, and let us go up to the mountain of the LORD, to the house of the God of Jacob; and he will teach us of his ways, and we will walk in his paths: for out of Zion shall go forth the law, and the word of the LORD from Jerusalem. 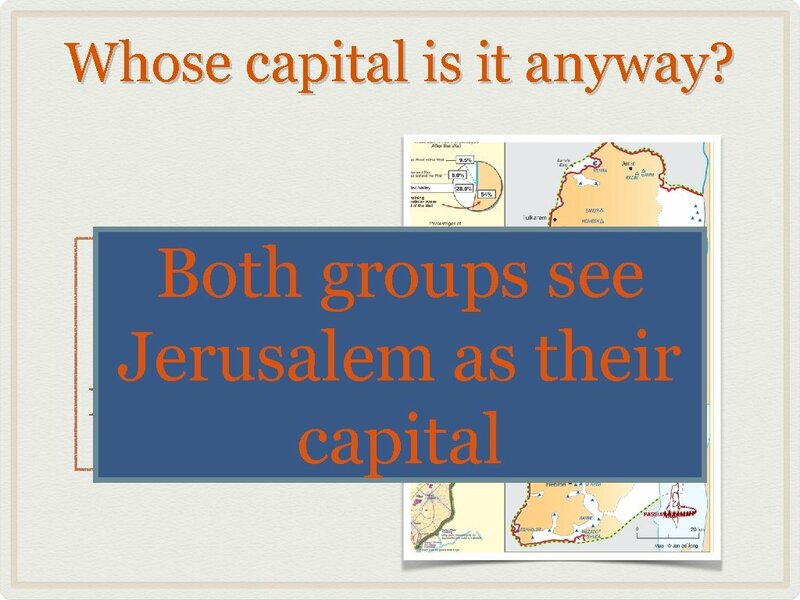 Jerusalem: Religious capital Zechariah 14: 16 Zechariah 8: 22 -23 Yea, many people and strong nations shall come to And it shall come of hosts in Jerusalem, and to prayof seek the LORD to pass, that every one that is left all the nations which came against Jerusalem shall before the LORD. 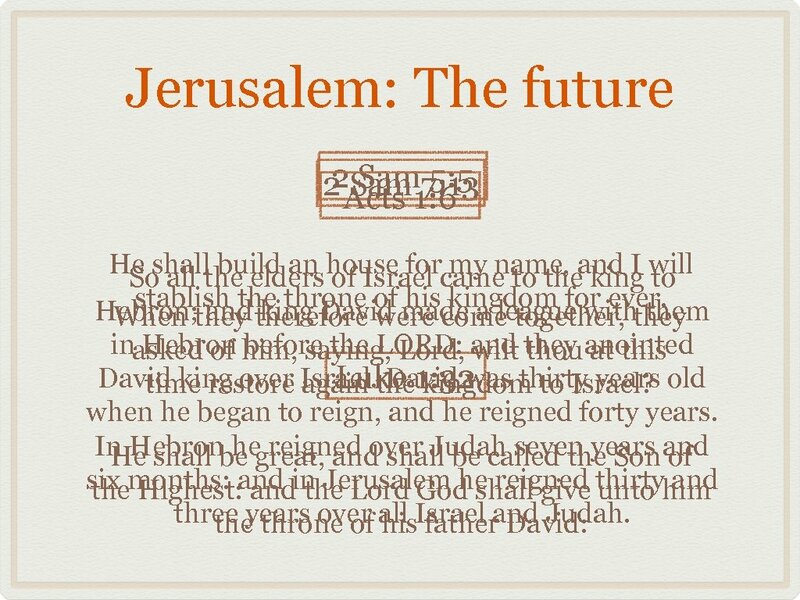 Thus saith the LORD of hosts; In even go up shall come year to worship the shall take those days itfrom year toto pass, that ten men. 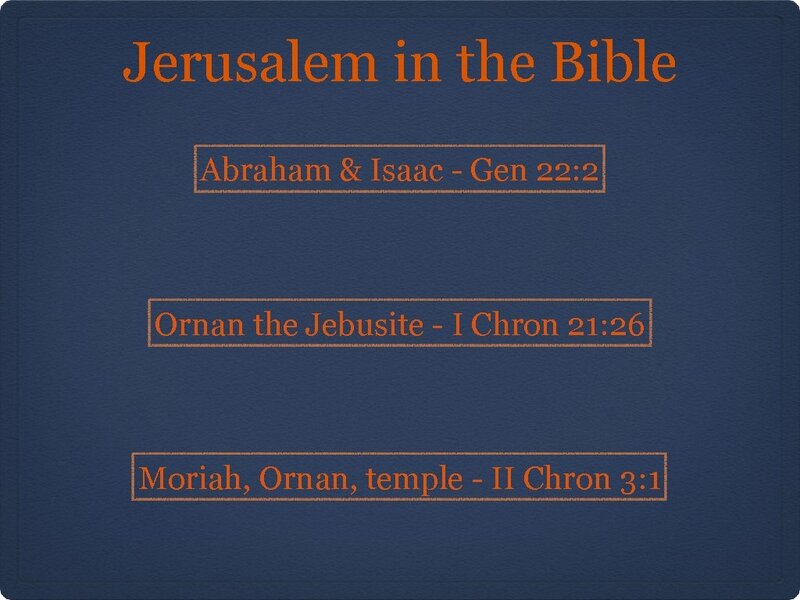 King, the LORD of all languages of the nations, even shall take hold outof hosts, and to keep the feast of tabernacles. hold of the skirt of him that is a Jew, saying, We will go with you: for we have heard that God is with you. 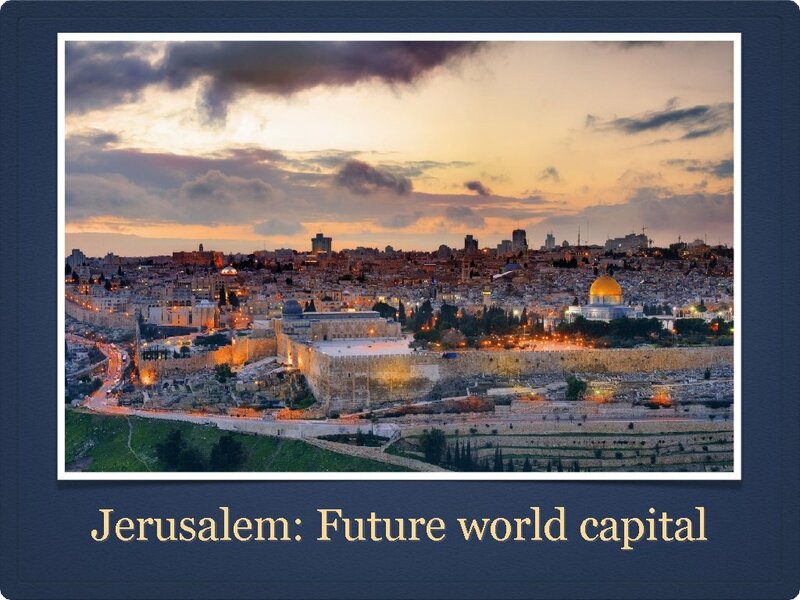 Jerusalem: The future Isaiah 3: 17 Joel 62: 7 And give him no rest, till he establish, and till So he makeknow that Ia praise LORD earth. 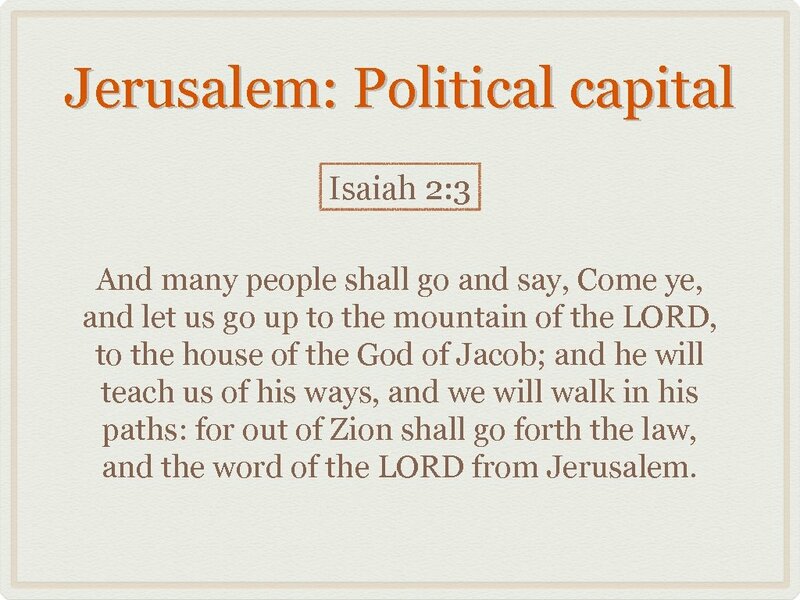 shall ye Jerusalem am the in the your God dwelling in Zion, my holy mountain: then shall Jerusalem be holy, and there shall no strangers pass through her any more.